The word cufflinks, is indeed interesting. It basically means linking both sides of the cuff. When a person wears or chooses to wear cufflinks it means that, he or she is going to wear a shirt or blouse that has full sleeves. The end position of the sleeve that goes around the wrist, is known as the cuff. This is where a pair of cufflinks would be worn, though ordinary buttons are often provided to do the same job. When we talk about cufflinks, most of us refer to cuff links for men but, the fact is that ladies can wear cuff links too. The important thing about cufflinks is that, they have utility value and are not plain fashion accessories like earrings or pendants. If you have tried to follow the trends in cufflinks for the past 3 or even 4 decades, you would have noticed that the changes would be quite dramatic. In the earlier days, full sleeves shirt manufactures often included a pair of simple plastic cuff links. These were the rigid type of cuff links and did not have any movable parts. Such cufflinks were moulded in a plastic factory and did not cost much. While you will not see too many wooden cufflinks today, there was a time when wooden cufflinks were quite porpular. Wood cufflinks of different shapes, sizes and designs were offered to both men and ladies. In this report we will talk about the modern trends in cufflinks. If you plan to get a pair of cufflinks or already own sum, this report is for you. The above image shows a pair of blue topaz cufflinks. Even a casual cufflinks at these made to order cuff links will tell you that style and utility have been perfectly balanced in these cufflinks. The demand for gem stone cufflinks is growing rapidly and some type of classification can now be made with confidence. For example, some cufflink buyers insist on natural gemstones for their cuff links while others, care more for the overall appearance and are not very particular about the stones in their gemstone cufflinks being natural. Since we have started our discussion with gemstone cufflinks, let us get into greater detail. There are some clear reasons why people love gems and even why people love specific types of gems. Take one more look at the image of the gold or 925 silver cufflinks shown above and we will share some true and exciting information with you. You will notice that blue topaz gems have been used to make these cufflinks. Let us presume that you were ordering these cufflinks, why would you choose blue topaz? The answer is not a single sentence as the reasons for the gem stone choice for your cufflinks can influenced by many factors. Men who wear gemstone jewelry love the color blue, this infact can be seen the choice of color for men's clothes too. Blue shirts, ties and trousers have always been favorites. Even mens casual wear clothes like T-shirts and jeans often include shades of blue. If you would like to get a pair of gold or 925 silver cufflinks with blue gems, your choices would be - blue topaz which is available in 3 shades of blue, blue sapphire, blue lapis and ofcourse turquoise. Out of all thes blue gems, blue topaz would give you the best equation between price, looks and durability. Not all of us like gems just because of their color, traditions and beliefs often influence the gem buying decision. The practice of wearing birth stones has existed for centuries, today it is believed that a specific gem represents each month of the year. If these cufflinks were being worn as birthstone cufflinks, you should know that blue topaz gems are the birthstones for the month of December. When you decide to get gemstone cufflinks there is an important decision to be made. You could choose natural or manmade gemstones, it is obvious that natural gems will cost more than factory made look-alikes or substitutes. There really is nothing wrong in wearing a pair of gemstone cufflinks that has, artificial gemstones. The important thing is that, you should know what you are getting and pay for what you are getting. The world of gemstones has today grown big, confusing and complicated. Gem providers often give fancy names to cheap or imitation gems and confuse buyers. Names like lab created, synthetic, imitation and even names like CZ tanzanite or simulated diamonds are often heard. Changes are happening at a rapid pace and a casual buyer can hardly be expected to stay updated. It is therefore important that you choose the right jeweler, before you make a buying decision. Not all gems are equally strong and sturdy, and it is not necessary that higher priced gems are more sturdy as compared to cheaper gemstones. The good thing is that, cufflinks are not put through the same degree of wear and tear as rings and other types of jewelry. For this reason, durability is not a big problem for gemstones used in cufflinks. Having said that, we would like to give you some useful tips regarding gems. It is good to ensure that gemstones do not get hit by physical impact - this is applicable to all gems both natural and man made. Some gems might fade if exposed to strong light and heat, so take care of that. The way you store or clean your gemstone cufflinks might be dictated by the specific gem type. A good example is emerald though, emerald cufflinks are not very common. Natural emeralds should not be soaked in water and should not be brought in contact with strong solvents or detergents. Gem selection is important and equally important is the type of gemstone mounting used. The worst way in which gems can be mounted in any jewel is by using glue. The glue can weaken over time and loosen the gem, jewelers are aware of this and yet, keep mounting gems with glue as it is easier and cheaper to do that. Prong setting is the use of small pointed (not very pointed) metal protrusions around the stone. The prongs are then pressed along the edge of the gemstone to hold it firmly. While this is a very popular method used to mount stones, you could find that the prongs get caught in pockets or other fabrics, this can cause them to gradually loosen up and ofcourse, ruin delicate fabric too. You will need to catch another glimpse of the blue gemstone cufflinks shown above, notice how metal borders the entire edge of the gemstone. This is undoubtedly the best way to set the gems in a pair of gemstone cufflinks. The fitting will be smooth without any sharp or pointed edges, the smooth feeling gives a stylish and confident appeal to the cufflinks too. We have talked quite a bit about gemstone cufflinks so let us shift to plain cufflinks now. When you refer to plain jewelry or plain cufflinks all you mean is that, no diamonds or other gems will be used in the design. Before you jump to the conclusion that plain cuff links without gems would appear dull and mundane, read the information provided here. There are a number of ways to enhance the appearance of plain sterling silver or gold cufflinks. For example, the shape of the cufflinks can be made to represent some meaningful symbols, characters or objects. For example, a tennis player might like to get a pair of cufflinks that shows a tennis racket on the face. An even more innovative way to design and craft plain cufflinks is to, use a meaningful shape to them. A football player might like to receive a pair of cufflinks that, are shaped like a football. You can use a dome shape for these with the bottom being flat. Choosing a texture for the surface of plain cufflinks is another way by which, the cufflinks could look better. We would suggest that, gemstone cufflinks not be made with textures that could distract attention from the gems. However when it comes to plain gold or 925 silver cufflinks, textures like pebble, tree bark, hammered and even a dull finish providing interesting options. You could ofcourse combine more than one texture in the same pair of cufflinks. This report is compiled to give you a general idea about the latest trends in cufflinks. We do not plan to do any marketing or selling through this report. 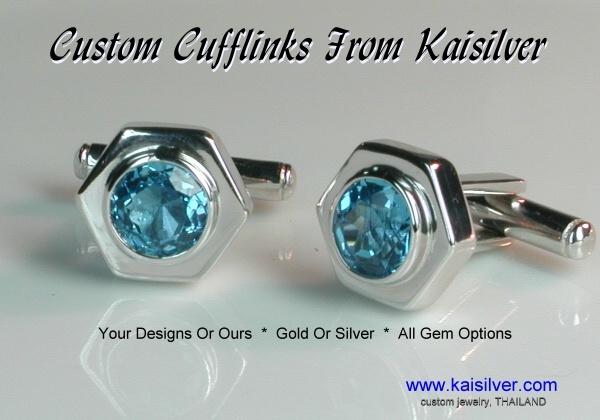 You can always visit the regular website at http://www.jewelry.kaijewels.com/man-cuff-link-kj-all.htm to see some excellent examples of fine cufflinks.